Amazon Price: $329.00 $99.00 You save: $230.00 (70%). (as of October 18, 2017 8:03 am - Details). Product prices and availability are accurate as of the date/time indicated and are subject to change. Any price and availability information displayed on the Amazon site at the time of purchase will apply to the purchase of this product. 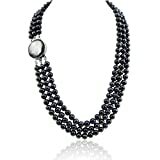 3-row Dyed Black Freshwater Cultured Pearl Necklace with Mother of Tahiti Pearl rhodium plated base metal Clasp(6.5-7.5mm), 19",20"/21". Most Appreciated Gift. Comes with most elegant jewelry boxes with most beautiful presentation.